On December 4, opponents of the Dakota Access Pipeline (DAPL) won a major victory when the Army Corps of Engineers announced it would not grant an easement for the pipeline to be built under Lake Oahe on the Missouri River. The “Water Protectors” who heroically resisted the pipeline for months celebrated the decision, but realized that the Corps’ decision did not mean the “Black Snake” was dead. The Corps stated that it would pursue further review and analysis through an Environmental Impact Statement, and it could still grant an easement at some future date. Donald Trump’s election only enhanced the sense that the fight is not won. Not only has Trump held financial interest in the pipeline (and likely still does), he is a friend of the fossil fuel industry and has never shown respect for American Indian nations. 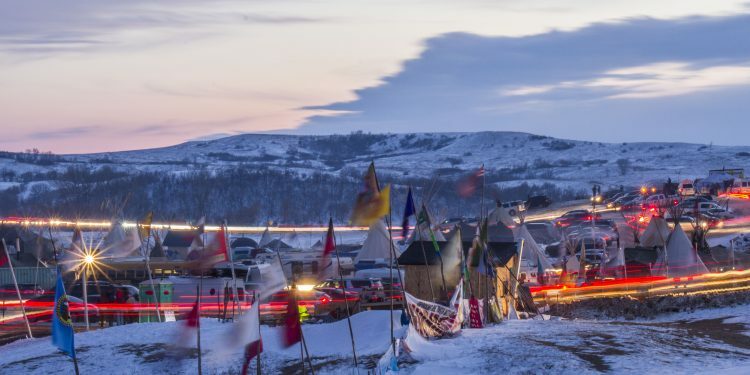 Pipeline advocates have challenged the Standing Rock Sioux Tribe’s contention that the pipeline is being constructed across lands recognized by the U.S. as Sioux territory in the 1851 Fort Laramie Treaty. Just days after the Corps’ decision not to grant an easement, outgoing North Dakota Governor Jack Dalrymple wrote an op-ed piece stating that the “the pipeline’s permitted route never crosses tribal land. Those opponents who cite the 1851 Treaty of Ft. Laramie to dispute who owns the lands conveniently ignore the later treaty of 1868.” It is worth examining these claims in detail. A close look at the record shows that Standing Rock and the Sioux Nation did not cede the 1851 Treaty lands . Furthermore, Standing Rock retains water rights from the 1851 Treaty and subsequent treaties. These water rights give the tribe jurisdiction over the Missouri River at the point of DAPL’s proposed crossing. 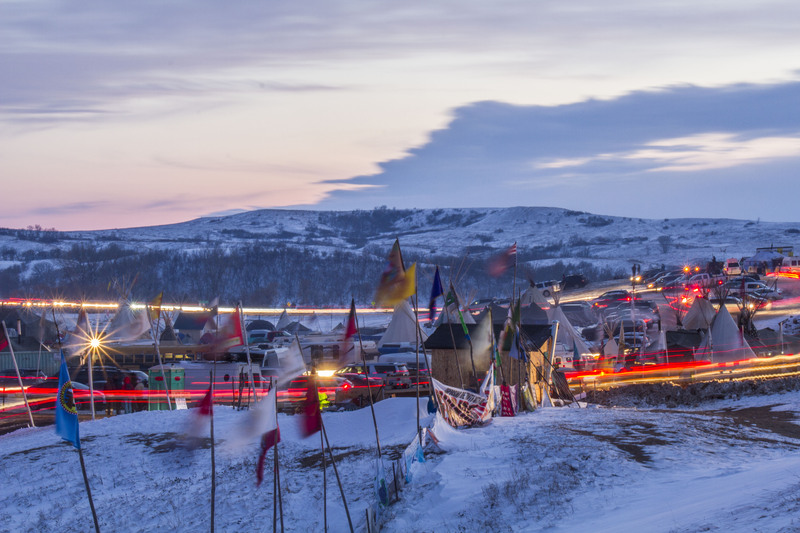 There is no question about the accuracy of Standing Rock’s contention that the pipeline is being constructed across lands recognized as Sioux territory under the 1851 Treaty. 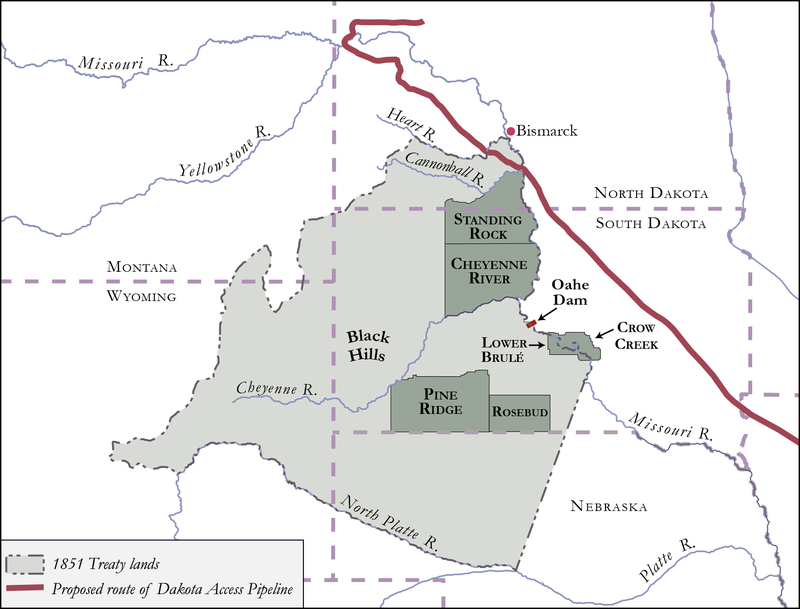 That treaty stated that the northern boundary for Sioux territory was at the Heart River, north of the DAPL route. At first glance, it may seem as though the Sioux ceded these lands under the 1868 Treaty. Article 2 of the 1868 Treaty established a “permanent reservation” for the Sioux with a northern boundary at the current border between the states of North and South Dakota, in other words, south of the DAPL route. However, under Article 16 of the 1868 Treaty, lands north of the permanent reservation were designated as “un-ceded Indian territory.” According to the Indian Claims Commission (ICC), in a 1978 decision, the northern boundary of the un-ceded Article 16 lands was the Heart River — the same boundary recognized in the 1851 Treaty. Did the Sioux ever cede the Article 16 lands? The answer clearly is no. After a military expedition commanded by George Armstrong Custer discovered gold in the Black Hills in 1874, the U.S. coerced a minority of Sioux chiefs and headmen into signing an agreement in 1876 that ceded the Black Hills along with the 1868 Treaty’s Article 16 lands. But the 1876 agreement violated a provision in the 1868 Treaty that any future land cession must “be signed by at least three-fourths of all the adult male” tribal members. After decades of litigation, the ICC ruled in 1974 that the 1876 agreement was an unconstitutional seizure under the Fifth Amendment. In 1980, the U.S. Supreme Court upheld the ICC’s decision, observing: “a more ripe and rank case of dishonorable dealing will never, in all probability, be found in our history.” Although the Supreme Court’s decision focused on the illegal taking of the Black Hills, the decision also applied to the 1876 Agreement’s abrogation of the 1868 Treaty’s Article 16 un-ceded lands, the territory currently in question. Under U.S. law, the federal government does not have authority to return lands illegally taken, and so the courts remedied the taking of the Black Hills and the Article 16 lands by awarding monetary compensation. The Sioux Nation, however, has consistently rejected monetary compensation for the stolen lands and has instead argued for the return of the majority of Black Hills lands that are under federal ownership. (Private property would remain in private hands.) Although Standing Rock would have a legitimate moral claim to lands south of the Heart River — across which DAPL is being constructed — the tribe is not arguing for the return of those lands. Nonetheless, the tribe’s position that the pipeline is being built across 1851 Treaty lands and that these lands have never been legitimately ceded is historically accurate and legally sound. Standing Rock has strongly opposed the pipeline’s current route since 2014, arguing that DAPL crossing the Missouri River would negatively impact the tribe’s water supply and violate its water rights. Once again, the tribe’s position is supported by treaties now codified within Sioux Nation tribal constitutions. The 1851 Treaty described Sioux territory as extending as far east as the Missouri River, a boundary designated by Article 2 of the 1868 Treaty as the “low-water mark” on the river’s east bank. The Standing Rock constitution, however, delineates reservation boundaries and jurisdiction according to the 1889 Sioux Agreement. Section 3 of the Agreement puts Standing Rock’s eastern frontier as “Beginning at a point in the center of the main channel of the Missouri River, opposite the mouth of the Cannon Ball River,” a location just south of the larger anti-pipeline encampment. Both the encampment and the DAPL Missouri River crossing site are technically outside reservation limits, but they are still on un-ceded treaty lands. The Standing Rock constitution was drafted with incredible foresight in order to protect tribal water; it reserves jurisdiction over “all rights-of-way, waterways, watercourses[,] and streams running through any part of the Reservation.” In spite of this, just months after the constitution’s adoption in 1959, the Corps completed construction of the Oahe Dam. As a result, fifty-six thousand acres of Standing Rock river lands were flooded and destroyed, hundreds of families dislocated, and the Corps assumed primary jurisdiction over the Missouri River and its shoreline without Standing Rock’s consent. Congress authorized Oahe Dam under the 1944 Flood Control Act (alternatively known as the Pick-Sloan Plan), which also authorized the construction of five more dams on the Missouri’s main stem, all disproportionately flooding Native lands. Pick-Sloan dams set into motion what the late Standing Rock Sioux scholar Vine Deloria, Jr. characterized as “the single most destructive act ever perpetrated on any tribe by the United States.” In total, 550 square miles of Native lands (half the size of Rhode Island) were destroyed and more than 900 Native families were dislocated. The Sioux were deracinated — violently uprooted — from their river. Did the Corps overstep its authority? Certainly, it did. The Flood Control Act only authorized the Corps to construct dams — not to expunge tribal jurisdiction. Its less-than-precise language in Section 4 opened the river for “public use” and “recreational purposes.” It did not strip any tribe of its authority or jurisdiction over the Missouri River. Still, the Corps condemned lands under “eminent domain,” and Congress awarded compensation in the 1958 Standing Rock Sioux Tribe Act. Yet neither the Flood Control Act which took the land, nor the Standing Rock Sioux Tribe Act which awarded compensation for taking the land, explicitly extinguished tribal jurisdiction; and neither authorized or provided any compensation for the Corps taking the river itself from the tribes. The Sioux Nation has since contended that the Missouri River and its shoreline were never legally ceded, and they are right. The Corps altering the flow of the river contravenes a 1908 Supreme Court decision known as the Winters Doctrine. The doctrine holds that however diminished current reservation boundaries may be, tribes retain senior, reserved rights to water flowing through the originally-defined boundaries established by treaty, statute, or executive order. Whether by dam or by ruptured oil pipeline, altering the flow of the Missouri River or any river within Sioux treaty territory violates the spirit of the Winters Doctrine. But the Sioux Nation has yet to legally invoke the doctrine because of rightful fear that any quantification of water rights, as history has shown, would likely result in endless constraints and the diminishment of tribal sovereignty. Nevertheless, Standing Rock and the Sioux Nation maintain a legitimate moral claim to the river. As we await the Environmental Impact Statement as to whether or not the Corps should grant DAPL an easement to cross the Missouri River, Standing Rock’s argument for treaty rights alone is compelling. This does not diminish other grievances, such as the pipeline company’s brazen defilement of tribal burial and cultural sites, or North Dakota’s copious use of violence against unarmed Water Protectors. For those who argue that Native treaties are archaic documents that are no longer valid, a certain document older than the treaties — the U.S. Constitution itself — regards them as “the supreme law of the land.” Are we to blame Standing Rock for asking the U.S. to obey its own Constitution? 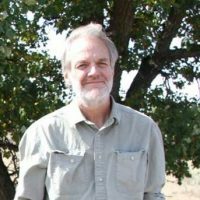 Jeffrey Ostler is Beekman Professor of Northwest and Pacific History at the University of Oregon. Nick Estes is a doctoral candidate in American Studies at the University of New Mexico, and an Andrew W. Mellon Dissertation Fellow.